WIi game Rhythm Heaven Wii (Minna no Rhythm Tengoku in Japan) is still the bestselling game in Japan, according to the people at Media Create. But Namco Bandai's Queen's Gate came closest to beating that with its suggestive, girl-on-girl role-playing brawler. 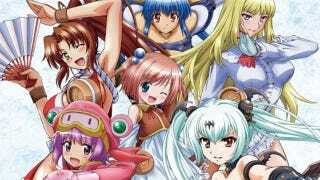 Queen's Gate: Spiral Chaos, the PSP sequel to 2009's Queen's Blade: Spiral Chaos, was the bestselling debut this week, moving nearly 67,000 copies. Atlus' Devil Survivor 2 for Nintendo DS was also a contender, selling more than 63,000 copies. There were two new Western debuts—Operation Flashpoint: Red River and Dungeon Siege III—on the charts, which you can see in the list below. Here are the bestselling games in Japan for the week of July 25 to 31, according to sales tracker Media Create. Hardware-wise, the PSP returns to first place in Japan, thanks to a dip in Nintendo 3DS sales. It would appear that Japanese gamers stayed away from investing in the 3DS before the price drop, putting it behind the Wii for the week. Also, the PSPgo sold seven units.